Translation of cognitive representations into written language is one of the most important processes in writing. This volume provides a long-awaited updated overview of the field. The contributors discuss each of the commonly used research methods for studying translation; theorize about the nature of the cognitive and language representations and cognitive/linguistic transformation mechanisms involved in translation during writing; and make the case that translation is a higher-order executive function that is fundamental to the writing process. 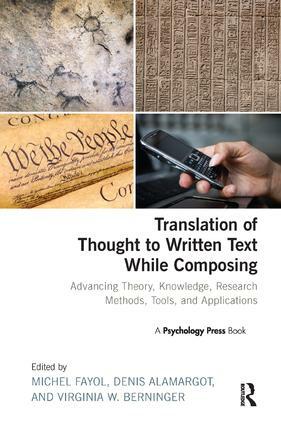 The book also reviews the application of research to practice -- that is, the translation of the research findings in education and the work-world for individuals who interact with others using written language to communicate ideas. This volume provides a rich resource for student, theorists, and empirical researchers in cognitive psychology, linguistics, and education; and teachers and clinicians who can use the research in their work. Why Use a Copy Task to Study Spelling in Handwriting?